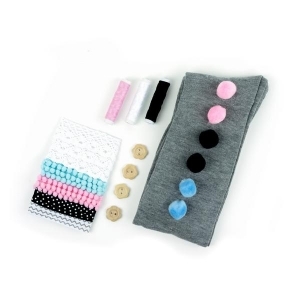 Inspire their inner fashionista with this easy to make DIY kit. Complete with trim, ribbon, buttons, pom poms, and more, they’ll love to design and wear their own super stylish (and snugly) socks. Watch them step out in a style all their own. 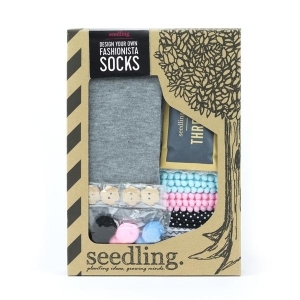 Kit Includes: Heather grey knee socks, Lace trim, Colourful pom pom trim, Polka dot ribbon, Chevron ribbon, Pom poms, Wooden flower buttons, Thread, Sewing needles and Instructions. Recommended for ages 7+ years.